Many people struggle with stress and anxious feelings. 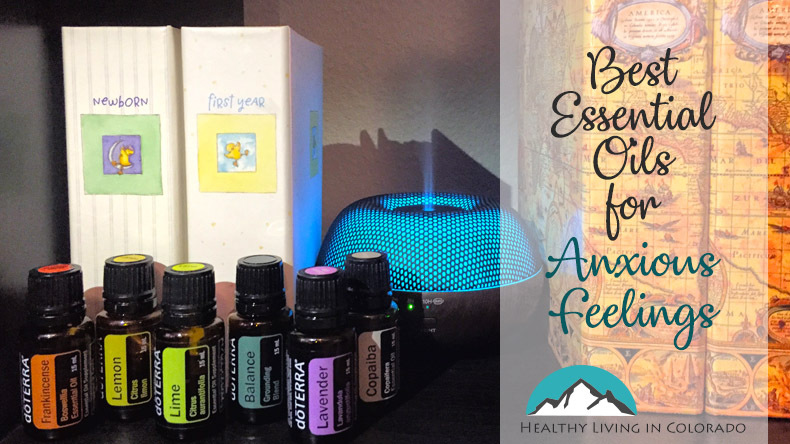 Here are some of the best essential oils for calming anxious feelings and helping to relieve stress. This also looks at CBD oil! Mood challenges and disorders are becoming increasingly prevalent in recent years. There are many reasons for this ranging from processed foods that most people eat to medications people are taking. There are several natural ways to treat stress and anxious feelings, but this article will focus on the best essential oils for calming anxious feelings, as well as CBD oil. The brain is protected by the blood-brain barrier. This barrier protects our brains from things like viruses, toxins, and other harmful substances. There are few things that are able to penetrate this protective barrier, but natural fat-soluble substances can. And this substance, sesquiterpenes, is found in many essential oils. Because of this, one of the best natural remedies to overcome anxious feelings and stress is essential oils. When you inhale essential oils, the compounds go through the olfactory system and to the limbic center of the brain. And the limbic system has glands that respond to emotions. This is obviously tied to stress, anxiousness and other mood challenges. Now that we’ve had a brief anatomy lesson, let’s look at how to use essential oils for calming anxious feelings and stress. First of all, oils work differently for each person, so a little trial and error can let you know which ones work best for you. The truth is that there are many essential oils that can help anxious feelings. Secondly, essential oils for mood challenges can have a cumulative effect. So just because you try using oils once or twice and it doesn’t work well does not mean that it will not work. Use each oil at least a week (2 weeks is even better) to see the results. A longer duration should lead to better results. Lastly, you want to use the highest quality essential oils. (Read more here.) Ones from the store are loaded with toxins and fillers that make them harmful at the worst, and ineffective at the least. If essential oils are newer to you, for your safety please read this article on Essential Oils for Beginners before moving on. Inhaling essential oils is a great way to feel better. You can put a drop in your hands and breathe it in. Or you can also use a diffuser filled with water and 4-6 drops of essential oil of your choice listed below. You can breathe it straight from the bottle. Breathing oils in is the fastest way to get results. Another way to inhale oils is by using essential oil jewelry. There are necklaces that you can add oil onto and smell them throughout the day. And there are bracelets which work nicely to keep adding oils onto your wrists as the day goes on. And you can put the bracelet up to your nose for inhalation as well. You can also apply essential oils to the skin. In the case of mood, you want to apply it as close to the limbic system as possible, which is on the back of your neck. On the sides of your neck/base of your skull, you can feel 2 indentations. Place 1-2 drops there with a carrier oil. You can also put it on your ears, behind your ears, on your forehead or under you nose. Often with stress and anxious feelings, being out of the house can trigger us. For that reason having a rollerball applicator is really helpful. They are small, convenient to carry, and can already be blended with a carrier oil so they are ready to use. Again, with a good quality essential oil (not one from the store), you can also take them internally. Be sure to read the bottle and it will tell you if it’s ingestible or not. 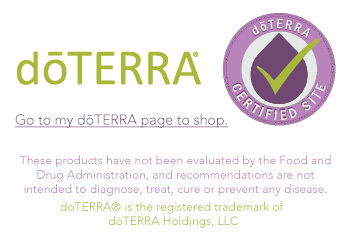 doTERRA’s oils say, “For internal use dilute 1 drop in 4 fl. oz. of liquid.” If the bottle does not say something like this, DO NOT INGEST. But if your oil is safe, there are many ways you can take essential oils internally. Ones like frankincense work great when pressed on the roof of your mouth. Put one drop on the pad of your thumb and press on the roof of your mouth for 30 seconds. You can also put a drop in water and drink it. Just don’t use plastic cups because the oils can eat through plastic. But a glass or water bottle like this is a good option. Or you can put a drop under your tongue. Finally, you could put a couple drops of oil in an empty Veggie Capsule and swallow it like a pill. Start with 2 drops and slowly add to it with time as needed. 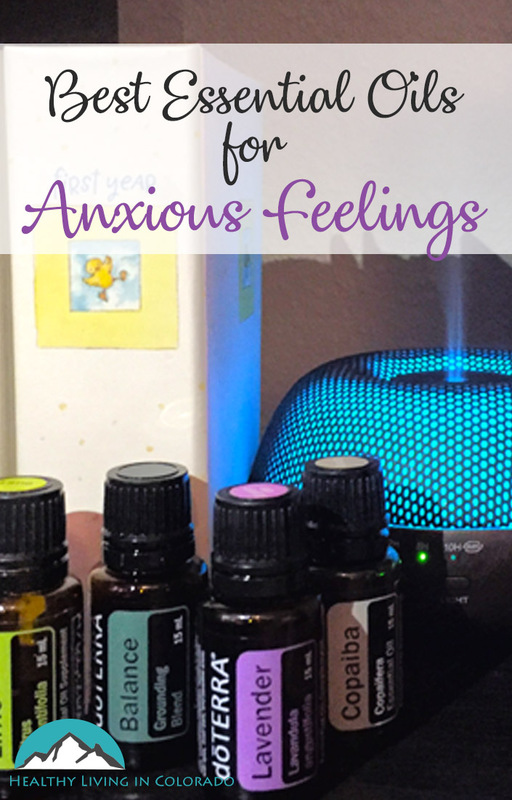 So now hopefully you understand more about how essential oils can help with anxious feelings and the different methods of use. Also beneficial could be understanding the cause of your anxiousness. If you know your triggers or how exactly you’re feeling, it could help in knowing which oils to start with below. Lavender: It’s calming and generally lowers anxious feelings. Bergamot: It reduces cortisol response and helps mood. Copaiba: It uplifts mood, can ease a troubled mind, and help calm stress and anxiety. Citrus oils like lemon, lime, grapefruit, tangerine, and green mandarin: These promote a cheerful and positive attitude. Frankincense: It is calming, tranquil, grounding, and helps you connect in meditation and prayer. Are you ready to give essential oils for anxiety a try? 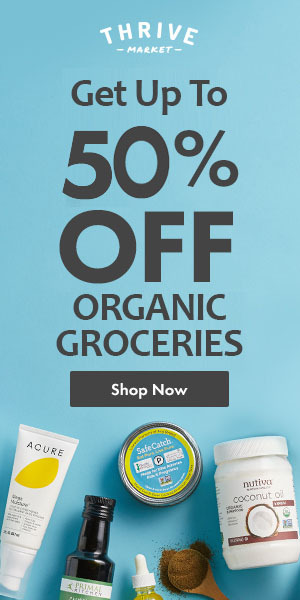 Shop here, and I am happy to help you get started. Please feel free to email me questions at allison@healthylivingincolorado.com. Recently doTERRA came out with Copaiba essential oil (mentioned above). Many people have seen that using copaiba oil benefits anxious feelings. It truly works, and I advocate for copaiba helping your mood. But what has also helped many people, including my husband and I, is using CBD oil in conjunction with copaiba essential oil. doTERRA copaiba reduces anxious feelings. And so does CBD oil. So in the Copaiba vs CBD oil debate, I would say – why choose? Why not use CBD and copaiba together? CBD oil combined with essential oils draws out the best of both products! So why not try both? You can combine some CBD oil and lavender or copaiba together in an empty veggie capsule and swallow. Or you can diffuse an essential oil and take some CBD internally just for a couple of suggestions. If you would like to try CBD oil for anxious feelings, please click the link. Cannabidiol Life uses third-party testing, so the products are not watered down and are quite effective. There are also gummies, lotions, vapes and many other items you may benefit from. This is also a good way to calm down and feel less stress. There is <0.3 percent THC in CBD oil (under the federal limit), and it’s organic. So it’s healthy and there’s no buzz! If you want other ideas about how to handle anxious feelings while traveling, here is a helpful article. I love essential oils and these are some great reminders for application. Yes! These are 2 of my favorites as well!